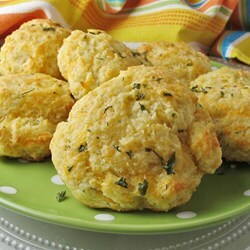 Excellent drop biscuits made with lots of real butter, garlic, and herbs! Sift flour, baking powder, white sugar, cream of tartar, 1/3 teaspoon garlic powder, and salt together in a large bowl. Mash unsalted butter cubes into the flour mixture with a pastry cutter or large fork until coarsely blended. Mix Cheddar cheese and Italian seasoning into the flour mixture. Pour milk over the flour mixture while stirring until you get a tough and sticky dough. Drop dough by the tablespoon onto the prepared baking sheet. Bake in preheated oven until lightly browned, about 15 minutes. Stir melted salted butter, parsley flakes, and 1/2 teaspoon garlic powder together in a bowl; brush over biscuits immediately upon removing from the oven.